The Navy Is Having Collisions at Sea. Here’s Why It’s Happening and What Should Be Done. Tom Callender is a senior research fellow for defense programs at The Heritage Foundation's Davis Institute for National Security and Foreign Policy. In the past two and a half months, the Navy has experienced the worst peacetime surface ship collisions in over 41 years. 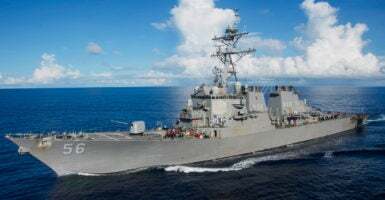 Two recent collisions—first the USS Fitzgerald (DDG 62), then the USS John S. McCain (DDG 56)—took place with commercial vessels and claimed the lives of 17 U.S. sailors during routine “independent steaming” operations in the western Pacific Ocean. These tragic incidents, coupled with the USS Antietam (CG 54) grounding and the USS Lake Champlain (CG 57) collision in the past eight months, have raised significant concerns about the state of the Navy’s surface fleet readiness and operational proficiency. Of additional concern is that all of these ships were part of the Seventh Fleet and the Navy’s Forward Deployed Naval Forces stationed in Yokosuka, Japan. Relieved Seventh Fleet commander, Vice Admiral Aucoin, due to a loss of confidence in his ability to command. While these are significant responses, will they be sufficient to alter the wayward course of Navy surface forces and the Seventh Fleet? Many in the American public have been asking how the “world’s best navy” could suffer such drastic failures in basic seamanship and navigation. Shouldn’t avoiding collisions be relatively simple for a Navy destroyer equipped with modern technology, such as GPS and radars? There have been numerous warning signs of problems within the Navy, and the Seventh Fleet in particular. Navy leadership has repeatedly warned of decreasing fleet readiness, while several legislative and Navy reports have warned of the impacts of increased deployment lengths, reduced training time, overworked sailors, and deferred maintenance on the operational readiness of the Navy. The Navy investigators will no doubt find deficiencies with the McCain and Fitzgerald crews that ultimately led to the collisions. However, a broader examination of the Navy’s surface forces and the Seventh Fleet in particular brings to light some deeper problems affecting the fleet. While the reports and readiness warnings from Navy leadership thus far have focused on the poor material conditions of surface ships, it is the surface navy’s eroded proficiency in basic seamanship and navigation—or “ship-driving”—that most likely played the major role in these tragic events. How did the Navy get to the point where its ships collide while conducting, as Adm. Scott Swift, commander of the U.S. Pacific Fleet, stated, “the most basic of operations”? Although numerous issues might be at play, the following are arguably the most substantial. 1. The Navy Fleet and its sailors are stretched too thin to meet the operational demands. As the Navy has shrunk from 316 ships in 2001 to 277 ships today, it has maintained approximately 95-100 ships continuously deployed around the world. This has required longer deployments (from six months to nine months, or longer), deferred maintenance, and increased equipment failures, placing even greater strain on the available ships. Ultimately, the amount of time available for training (and often sleep) has suffered as operations and maintenance have taken priority. This means that not only are today’s sailors not as well trained, but they are often extremely fatigued, which further degrades their performance. Substantial changes to the surface warfare community’s training and professional development over the past 14 years have left little time for intensive navigation and mariner skills training for junior officers and sailors. In the training time available, the focus is on learning to use modern electronic navigation aids such as GPS, digital charts, and radars. With approximately one-third of a ship’s crew rotating out each year, it can be a struggle just to train and qualify these new sailors to stand watch and operate the ship, let alone make them expert mariners. 2. The extremely high operational demands on these forward-deployed ships, and the lack of a formal training and deployment certification process, has left little time to train and evaluate their proficiency. These forward-deployed ships are often tasked with performing missions based on availability, not mission certification. By contrast, the Seventh Fleet submarine force has established requirements and procedures for periodic deployment certification of its assigned submarines. 3. Eight years of continuing resolutions and the Budget Control Act (or “sequestration”) have taken a heavy toll. In striving to meet the reduced funding limits imposed by these legislative actions, Navy leadership was often forced to cut near-term operations and maintenance funding. This further compounded the maintenance backlog and reduced non-mission-essential ship underway days, resulting in less operational ships and even less time for training. Although the Navy has recognized the readiness problem and has prioritized operations and maintenance in its fiscal year 2018 budget, another looming continuing resolution for the first quarter of fiscal year 2018 would at a minimum delay these efforts, as well as any additional corrective actions that may result from the comprehensive review of surface fleet operations. Navy leadership, as well as Congress, must prioritize surface ship seamanship and navigation proficiency and provide its commanders and sailors with the time, funding, and additional manpower to properly train and assess the proficiency in these most basic and critical seamanship skills.